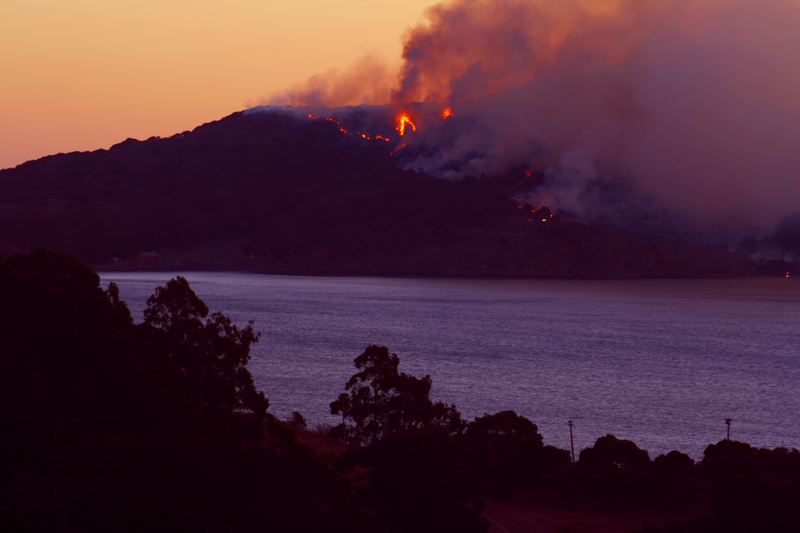 The fire on Angel Island in October 2008, is an example of the bogus claims of the flammability of eucalypts. According to an “environmental scientist” from the California state park system, 80 acres of eucalypts were removed from Angel Island over 12 years ago. Only 6 acres of eucalyptus remain. (“Rains expected to help heal Angel Island,” SF Chronicle, October 14, 2008 ). The fire that burned 400 acres of the 740 acres of Angel Island stopped at the forest edge: “At the edge of the burn belt lie strips of intact tree groves…a torched swath intercut with untouched forest.” (“After the fire, Angel Island is a park of contrasts,” SF Chronicle, October 15, 2008). We are glad to add this information. It’s actually an excellent illustration of the typical nativist argument, which can be paraphrased as, “There were no wildfires on Angel Island during the 100 years that an 80-acre eucalyptus forest lived on the island, but that doesn’t prevent us from demonizing them now that they are gone by speculating that if they were still here, the fire would have been worse.” There was no evidence provided then or now that the fire might have been worse. Our interpretation of the facts is that there might not have been a wildfire on Angel Island in 2008 if the eucalyptus forest had not been removed because it would have provided the windbreak to stop the wind driven fire and it would have prevented ignition by shading the forest floor and precipitating the heavy fog that drifts over the island. The dry grassland that replaced the forest was more likely to ignite and spread the fire more rapidly than any forest would. We usually avoid making provocative observations such as this, but in this case it provides an example of our very different perceptions of reality. Wait! Am I missing something? For 100 years the eucs existed on Angel Island without ever burning. Then, a few years after the eucs are clearcut, we have a spectacular fire on the island which roars through the grass, shrubs, and oaks. The fire stops on its own at the edge of the remnant stand of eucs. And someone wants to twist this into evidence for alleged extreme flammability of eucs? That’s the most extreme refusal to look at real world evidence I have seen in many years of observing the war on eucs.